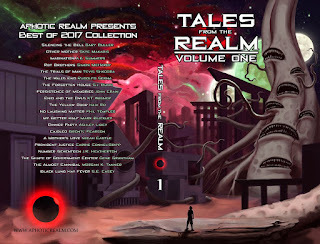 To celebrate the release of Aphotic Realm's first anthology featuring twenty dark twisted tales of strange and sinister fiction, I'm chatting with S.E.Casey, author of, Black Lung Hay Fever. Hi S.E.Casey, tell us a bit about yourself. 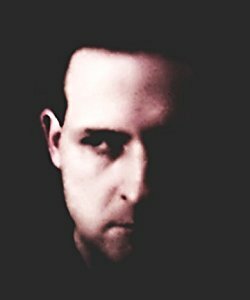 I started writing four years ago based on a random conversation I had with a co-worker about e-books and indie publishing. One day I wasn't writing or thinking about writing, and the next day I was. What started as an absurd game to get something published on Amazon morphed into other games of writing a better story, being published in an online magazine, being included in a print anthology and getting paid for it… I try to make everything into manageable games, otherwise I drift and wallow in an illogical resentment that life doesn't just give me everything I want without having to ask. Who are your biggest influences when it comes to writing? Growing up, the two biggest authors of horror were Stephen King and Clive Barker. I unequivocally gravitated to Barker. Where King's stories are very much about people and the relationships between characters, Barker's stories are about the world and ideas. I didn't understand the difference at the time, but I am someone who is far more interested in things than in people. So the surreal and philosophical authors I stumbled on after, such as Camus, Sartre, Selby Jr., Lovecraft, and Ligotti, were of particular interest to me. Name a great horror book, story or magazine that you've read recently. I have recently finished the first issue of Vastarien, a quarterly literary journal dedicated to the corpus of Thomas Ligotti. It's great stuff, full of ideas and things. I have also been going through the back issues of Hinnom Magazine, a focused, quality horror/sci-fi publication of which I have recently become a fan. Also, Alectryomancer and Other Weird Tales by Christopher Slatsky and Beholding the Void by Philip Fracassi are really strong short story collections. 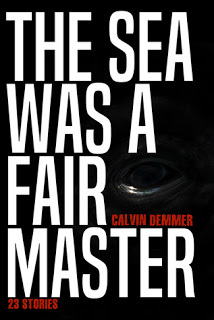 Currently, I am about to start in on a collection of flash fiction, The Sea Was a Fair Master, by Calvin Demmer with Furnace by Livia Llewellyn on deck. As previously said, I have been writing for four plus years. There has definitely been a steep learning curve. Fortunately, I had no idea how difficult writing actually would be or I may have never started in the first place. However, to not discourage anyone else, like any worthwhile endeavor, the satisfaction gained in reaching that next competency plateau is uniquely rewarding. What's a typical writing day for you? I write in between the administrative repetitions of job, home, family, etc. I consider thinking about what to write and daydreaming about all possible story iterations as a necessary part of writing. So in the vacant time of my commute, work meetings, company lunches, and any family functions all count as a part of my writing. The actual get-on-a-computer and type happens at night whenever there is time and I have the energy. Do you have a story that you've written that you are particularly proud of? I'm a terrible parent, the next story I am planning to write is always my favorite. What motivates me is that future story (or game) where I get everything right—theme, plot, pacing, a great first line, the perfect ending… That being said, my most recently published story "Animal Control" is in some ways my most accomplished. I'm a big fan of misdirection and through the feedback received, I think I succeeded to some extent. "Animal Control" can be found in the Molotov Cocktail Lit's "Killer Flash" contest issue where it won third place. 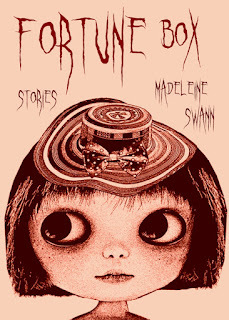 I am working on a short story collection of Christmas/winter weird-horror stories. I have been working on this for a few years, but have been reluctant to do the final edits and publish. Since my writing is getting better and better, I have been dragging my feet knowing that I am developing the skills to potentially improve every story. Using this logic, I will never finish, of course. But the plan is to be done this year, although there are always submission calls that pop up to steal away my attention and time. If you could throw an amazing dinner party, who would you invite? Guests can be living, dead and fictional. I'm not a people person at all—my biggest concern is how to keep people out of my house. I don't like the idea of bringing back someone who is dead; there would be too many questions, too many regrets. What do I do if they start bawling? Yuck, could be depressing. A fictional character? Too many unknowns. I'm not a gambler, especially when it comes to people. If I had to answer, I guess I would have Crispin Hellion Glover over. He's always been interesting to me, eccentric, provocative, and explosively controversial , but also somehow gets cast as the dad in the fatally mainstream Back to the Future. But no dinner party, far too awkward. I would have him bring over his self-produced movies. He hasn't released these publicly, they have only been showed in private screenings so this would be cool. Still, even this could be a little too intimate, so I'll invite some twitter people, say Madeline Swann, B.P. Gregory, and Kelly Evans to be my social buffers. I think these three wouldn't be at all offended by Crispin's taboo-heavy weirdness, and they seem appropriately chatty. Of course, I will sneak away at the end of the night to avoiding the awkward good-byes. Just lock up before you leave everyone! Tell us about your story, Black Lung Hay Fever, what was the inspiration behind it? 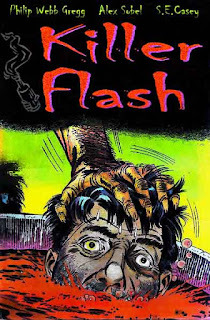 Before my Aphotic Realm story "Black Lung Hay Fever", I wrote a flash fiction story for Molotov Cocktail titled "Straw Poll for Regime Change" (I have a thing for disorienting titles I guess), which, too, was about a scarecrow. Gary Buller, who also has a story featured in the Tales from the Realm, always comments positively on this story whenever I post a link. Since Gary and I have a bit of a "Spy vs. Spy" relationship, after he wrote a sequel to one of his short stories (The Way Out/The Way In), I figured two can play at that game. So it was simply a case of reverse engineering a follow-up scarecrow tale. Where the scarecrow in "Straw Poll…" exits the field to menace a town, this is too easy. There is a lot of horror about attacks coming from the outside. However, this is an irrational fear, only a very few of us die at the hand of another. The universal horror is that of failing from the inside—eventually our organs will quit from wear and we will rot from within. Every one of us. So I imagined a more subtle, but real dread: a non-ambulatory gravity in a dormant field squeezing an outmoded mid-western town to the breaking point, turning its own stagnant apathy and faintheartedness upon itself. A writer of the weird, grotesque, and darkly wonderful, S.E. Casey’s philosophical horror focuses on a collection of oddities, forgotten places, and fallen characters. The horror isn’t the blood on the knife, but in the waste of the void. It is in vacant corners and empty rooms. It is in the endless pathologies of the phenomenally ungrateful. These neglected alleyways find their way to the same existential dead-end of Hell is other people. Twisted and strange tales explore aesthetics, absurdism, transcendentalism, and misanthropy from an off-center perspective.